Steemit is a blockchain-based social media platform that aims to “tokenize the content web.” Users can not only create and curate content on Steemit but also monetize content and grow the community. The platform aims to support social media and online communities by rewarding much of its value to the people who provide valuable contributions. On Steemit, people earn rewards in the form of cryptocurrency when their blogs get upvoted by other users of the Steemit. Steem Media Token (SMT) is the digital asset on the Steem blockchain that can be quickly launched by anyone to help monetize online content and give incentives for the content creator. STEEM: It is the fundamental unit of account holder on the Steem blockchain. It is a unit that users receive for participating in Steemit. STEEM is a liquid currency and therefore can be bought or sold on exchanges. 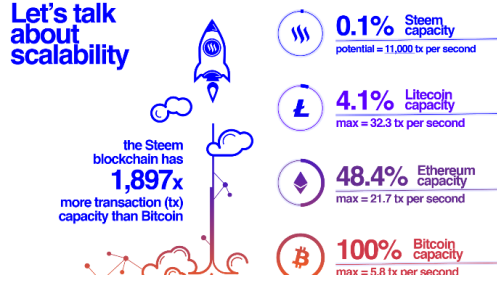 Steem Power: Users are able to commit their STEEM to a thirteen-week vesting schedule, providing them with additional benefits within the platform. STEEM that has committed to a thirteen-week vesting schedule is called Steem Power (SP). Steem Power cannot be easily traded on cryptocurrency exchanges. By holding SP, a user has more influence on the Steemit platform. Users of higher SP have more influence on the distribution of rewards. Transferring from Steem to SP is known as power up and from SP to Steem is known as power down and it is returned to the user via 13 equal weekly payments after the pool down is initiated. It is also used to reward users that participate in Steemit and it is pegged to the US dollar. It is denoted by the symbol SBD , an acronym for Steem Blockchain Dollars. Creating SBD requires a combination of a reliable price feed and rules to prevent abuse. SP holders can elect individuals called witnesses to publish price feeds. The Steem blockchain requires people to create a block and the consensus mechanism they use is the Delegated Proof- of -Stake. Delegated Proof of Stake (DPOS) is the fastest, efficient, and decentralized POS mechanism. It uses a reputation system and real-time voting to achieve consensus. In Delegated POS, community members vote for super representatives and super representatives will produce valid blocks successively based on specific distribution rules and success to do so results in the highest reward. The community members elect witness who are trusted members, who contribute positively to Steem and Steemit in many ways. There are 20 full-time witnesses, producing a block every 63 second round. Every round, the top 19 witness accounts are delegated to produce a block, 1 block is produced by a backup witness. Each account can vote up to 30 witnesses. Steem introduces a new concept called “Proof-of- Brain” which refers to the reward system that is divided between curators, content creator and witnesses. Curation Rewards: When another author publishes a post or comment and you determine it to be valuable enough to upvote it, you get rewarded a share of the value of your upvote as Curation reward. Steem claims that it is fast – almost 200x faster than Bitcoin. The Steem blockchain confirms over 1.3 million daily transactions every 24 hours – which is higher than Ethereum (1.1 million) and Bitcoin (300,000). Steem takes 3 second block time transfer speed. According to StateOfTheDApps, the top 4#dApps are all on Steem. MIRA, a major scalability project is making serious progress. MIRA stands for Multi Index RocksDB Adapter and its purpose is to allow Steem blockchain nodes to store almost all necessary data in the disk in a modern database instead of in RAM. Steemit announced that it MIRA is now consistently generating state files around every 2 hours and have accomplished a record streak in terms of regular state file generation. 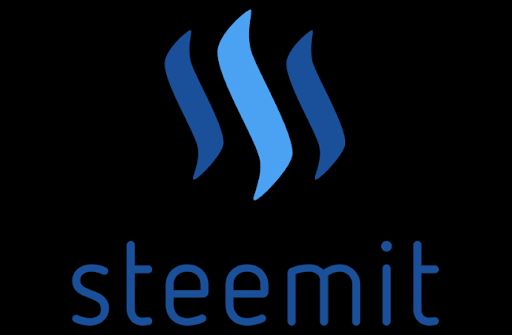 Steemit has also introduced SwapSteem, a peer-to-peer exchange built on the Steem blockchain, which aims to create a platform to enable Steem users to trade their STEEM/SBD for anything with other users activity. The pair has lost almost more than 95% after hitting high of $9.25 on Jan 3rd, 2018 level (Bittrex). It hit 2018-low of $0.212365 on December 15. STEEM has jumped from that level till $0.5880 and is currently trading around $0.4850. 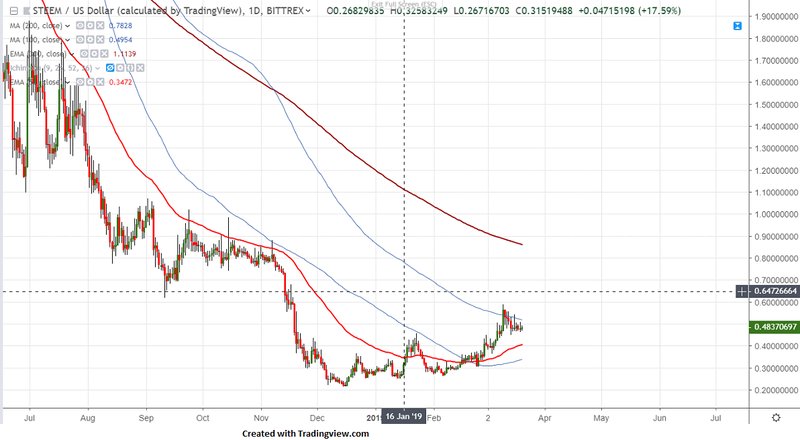 The near term resistance is around $0.5220 (200-day MA) and any daily close will take the pair till $0.86 (300-day EMA)/$1.02. On the lower side, support stands around $0.4500 (20-day MA) and any convincing break below targets $0.40/$0.330. It should break below $0.2100 for further bearishness. Recommendation: It is good to buy for long term investment for a target of $1.